Charles Gaines, Faces 1: Identity Politics, Drawing #3, Karl Marx, (detail), 2018, ink on paper, 20 7/8 x 16 7/8 in. (53 x 42.9 cm). Paula Cooper Gallery is pleased to present a new series of large-scale works by Charles Gaines, entitled Faces 1: Identity Politics. Exploring the relationship between aesthetics, politics, language and systems, the exhibition will be on view at 521 West 21st Street from May 3rd through June 9th 2018. For more than forty years, Charles Gaines has employed rule-based methodologies to investigate the disparities and slippages between visual and linguistic meaning. His new series, Faces 1: Identity Politics, comprised of twelve large-scale works, marks an extension of this interest in serialized projects, in particular his series Faces (1978-79). 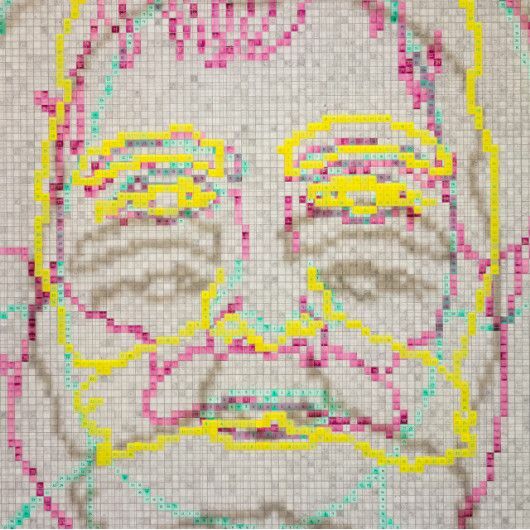 For his new works, painted on gridded clear acrylic panels, the artist outlines portraits of distinguished thinkers who have developed concepts of identity, ordering them chronologically from Aristotle to the present, including Maria W. Stewart, and Karl Marx, and bell hooks. Filling the cells with vibrant pigment, he plots numbers to index the contours of each face to create a pixelated image. As the series progresses, the portraits of previous thinkers in the sequence, each denoted by a different hue, appear on a posterior panel, resulting in a prismatic kaleidoscope of layered faces against the superimposed acrylic panel. On view in the small gallery is a new Manifestos, a body of works in which Gaines creates musical scores through systematic transliteration of revolutionary manifestos. For this new piece, Manifestos 3, the artist draws from two texts: James Baldwin’s 1957 essay, “Princes and Powers,” and a speech given by Martin Luther King Jr. on December 7, 1964 in London. Translating the texts into musical notation by assigning notes to letters of the alphabet, Gaines presents the finished sheet music as two large graphite drawings. A corresponding single-channel video monitor scrolls the original text while speakers broadcast the performed score, enacting a comparison of these various semiotic systems. Gaines recently released a new record, Manifestos 2, in February 2017 through Dog w/a Bone. Composed by Gaines with musical arrangement by director and composer Sean Griffin of Opera Povera, the scores are performed by a nine-piece orchestra. Gaines’ Manifestos 3, on exhibit, is a continuation of this series, with Gaines himself arranging his algorithmic compositions, this time for solo piano. Highly regarded as both a leading practitioner of conceptualism and an influential educator at the California Institute of the Arts, Los Angeles-based artist Charles Gaines (American, b. 1944) is celebrated for his works on paper and acrylic glass, photographs, drawings, musical compositions, and installations. He has had over 80 one-person shows and several hundred group exhibitions in the US and abroad including the 2007 and 2015 Biennale di Venezia. In 2015, he presented a critically acclaimed retrospective exhibition at the Studio Museum in Harlem and the Hammer Museum. Gaines’s work is collected by major institutions including at the Museum of Modern Art (New York), Whitney Museum of American Art, and the Studio Museum in Harlem and the Los Angeles County Museum. A recent large-scale commission for the Institute of Contemporary Art, Miami, will be on view through November 18, 2018. His compositions created by translating revolutionary texts into musical notation have been widely performed, most recently in Australia at the 2017 Melbourne Festival, at the Brooklyn Museum in 2016, and at the 56th Biennale di Venezia, Venice. In 1977, Gaines received a grant from the National Endowment for the Arts, in 2007 a United States Artists Fellowship Award, the 2013 John Simon Guggenheim Memorial Foundation Fellowship, the 2015 CAA Artist Award for Distinguished Body of Work, and is the 2018 honored recipient of the REDCAT award.